The very first timepiece of that new collection will be the one dedicated to ONLY WATCH 2013. In a market dominated by automatic watches, CYRUS has dared to launch a timepiece with manual double barrel winding and a seven-day power reserve. 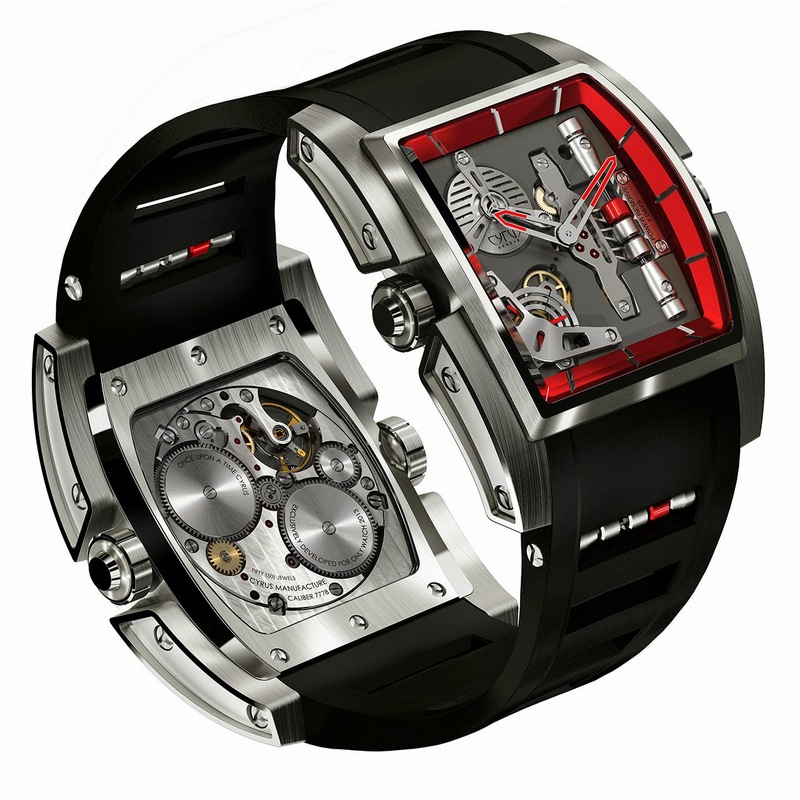 The movement (290 components, 50 rubies) is a 100% in-house manufacture movement, created under the aegis of renowned, award-winning Swiss watchmaker Jean-François Mojon. The design of this timepiece (available in titanium and black / red gold DLC titanium) was developed in perfect synergy with the brand’s identity, which places great emphasis on attention to detail. Recognizable as a CYRUS from first glance, it has a sleek design, where each element has been carefully weighed up and designed by our in-house team. A patented design, which perfectly moulds the shape of the wrist. This collection is the fruit of the partnership between our two founders, Julien and Laurent LECAMP. The selection of functions, the manual movement, the design features and the unusual bracelet were all created and developed within the family, with the utmost respect for the CYRUS philosophy. 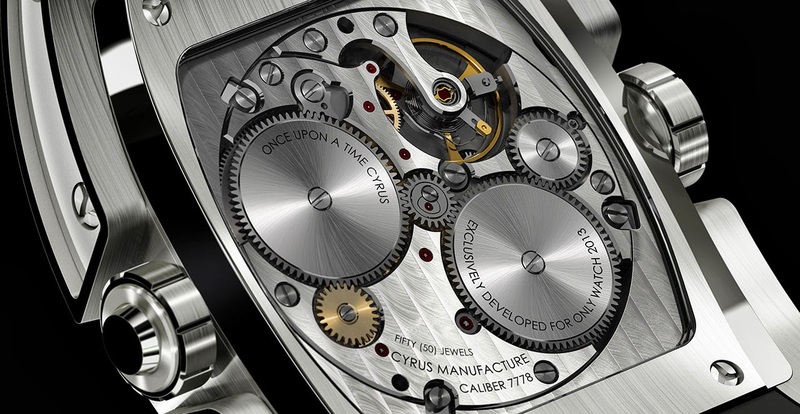 The distinctive mark of the two cousins can be found discreetly inscribed on the back of the calibre. Four digits, 7778 are etched, recalling the cousins’ two birth dates. Highlighting the classic character of this new timepiece, CYRUS offers elegant functions (hours, minutes, seconds, power reserve) and a unique, secret animation, all brought to life by a spectacular movement which is fully visible through the transparent sapphire crystal case. 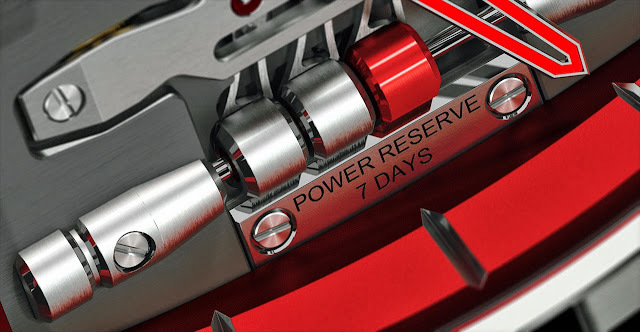 At first glance it catches your eye, the power reserve (between 2 and 4 o’clock) will captivate you with its three barrels sliding progressively along a vertical axis as the seven days unfold...Each barrel has a power reserve of two days, apart from the final barrel (three days). The red colour of the final barrel and the upper dial reminds you of the colour of the Principality of Monaco. The seconds function is truly original and technically advanced, with its three angled hands (red colour), each of which counts 20 seconds before passing the baton to the next hand. Then there is the secret animation (between 9 and 12 o’clock), which is activated by simply pressing the crown at 9 o’clock. The text ‘pièce unique’ then appears. Press it again, and ‘the flagship of Monaco’ appears to replace the previous inscription. Press one last time and...the CYRUS logo will be there. The design of the bracelet has also been carefully thought out. A perfect continuation of the curve of the timepiece, the bracelet also has at its centre an opening, at the heart of which there are three barrels in a mechanism which recalls the ‘abacus’ design of the power reserve. One question remains. Why did we call this collection ‘KAMBYS’? CAMBYSES was the name of CYRUS THE GREAT’s son and successor. Since each of our collections is linked to the history of CYRUS (the ‘KUROS’ collection takes its name from the Greek for CYRUS, for example), it seemed obvious that we should create a collection which paid homage to CYRUS THE GREAT’s son, adapting his name slightly so that it starts with a ‘K’ – the letter with which the names of all three of our collections begin. ‘K’ for ‘KING’, naturally. Three hands (red color) with three arms of different lengths to cover the three sectors of 120°. Each hand (inclined by 8°) passes over to the next every 20 seconds (0 -> 20 sec. / 20 -> 40 sec. / 40 -> 0 sec.). Three barrels slide progressively, one after the other, along a vertical axis. The two smaller cylinders each represent two days of power reserve. The third barrel represents three days. Openwork design with moving barrels, echoing the power reserve of the watch itself. The very first piece in this collection is the one for ONLY WATCH 2013 charity auction.